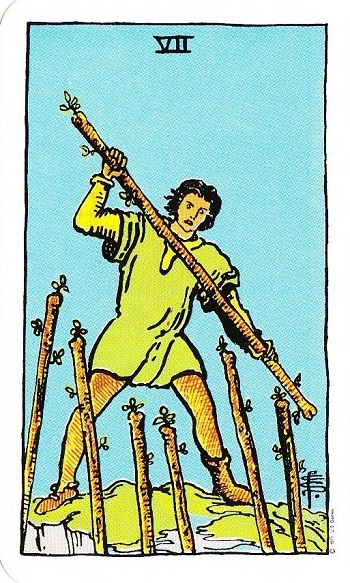 In the Seven of Wands, we see a man with one Wand on a hill, fighting off six other Wands that are pointing towards him. He is in a good position to tackle what comes his way, but he might also be flapping his arms around to no avail if the wands are just sitting there and are no treat to him at all. Today we might be fighting things (tasks) off from a position where we have enough energy to do them all. If this is productive, it is great. If it is an exercise to keep busy we might need to reassess. Why are we doing this? If it relates to someone close to us, what can we do to help them rather than give them more wands? As the number of Wands is slowly increasing we find that we are getting faced with some of the challenges that belong to these wands. There are several issues with wands that can come up; there could be a waste of energy, there might be a need to keep active, action might rule over logical or rational thought. 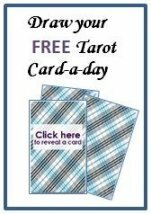 When drawing this card you might just want to reassess if your energy is spend wisely. Part of my personality is a fire sign so I like to do things, a lot of things, often….. which in turn can have its own set of problems. Sometimes when drawing this card I might have so many things on my plate I don’t know what to do with. Other times I might make lists, or to do lists or feel stressed without any real reason. The wands are just standing there and are no real threat or urgent matter. In the Osho Zen we find a meaning very closely to what I described above. The card is called stress and shows us a clown juggling on a balloon that could pop any minute. It hones in on the idea that stress is not necessary a real thing, we partly create it. The Crowley Tarot has a more positive spin on Seven of Wands, calling it courage. It shows one different Wand and six similar ones. This one wand dares to be different and stand out. In the Celtic Dragon Tarot we find a young woman standing close to her dragon ready and focussed on what will be next. 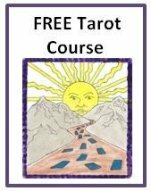 This card brings to it a new dimension and makes it more a spiritual practise than just an action packed image.